Follys beaches are about to get lot of sand. $20.4 million worth of sand, in fact. The Fiscal Year 2013 Work Plan by the Office of Management and Budget released this month includes over $20 million for the US Army Corps of Engineers to renourish Folly. 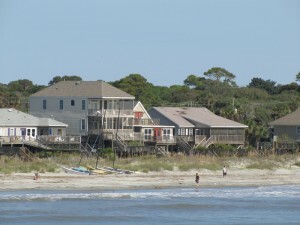 The barrier island looses a little more sand with every tropical storm or hurricane that brushes the coast. And dwindling beaches, houses very close to the waters edge, and closed county parks are just some of the symptoms of beach erosion. The issue also plagues the islands wildlife, like the loggerhead turtles who come to nest each year. But the approved funds, along with the City of Folly Beachs 15 percent cost share, means that 1.5 million cubic yards of sand can be pumped from the bottom of the ocean to the almost five and a half miles of Follys beaches. This renourishment project will work in harmony with the renourishment project recently completed at the Folly Beach County Park site, which has just invested $3.5 million to add more sand to the park space and to build a terminal groin to help alleviate future erosion. Construction is scheduled to begin at the end of October. Are you really taking federal money. Do you think Lindsay Graham has a right to even ask, after denying aid to New Jersey. What hypocrites you are. I think I lived out at Folly the last time the beach was renourished in 2001? I'm not sure what the cost was the last time however 20 million does seem like a lot of money for sand and I have to wonder who it's really helping. It seems like those who benefit the most are those with homes along the waterfront. Perhaps they should contribute to the cost. JCoghlan I think that's a great idea! Has it been used elsewhere?